Sorry I haven’t done these in quite a while, school and work got a little backed up but I was able to read Truthwitch and finally do a Hype or Like Friday review of the book. While this wasn’t on my TBR, I did see this book a lot at bookstores and even the blogoshphere, and I decided to read the book because I do like fantasy novels, and this book is totally worth the hype. First of all, I love the setting of the book and how it deals with an impending war and how it would effect both Safiya and Iseult, two friends. What I love is seeing the friendship between Safi and Iseult because you never see much female friendships in YA and even though they did spend parts of the book away from each other, you still get a glimpse of their relationship. Both Safi and Iseult also deal with how the impending war impacts their family. Safi has to deal with her uncle trying to broker a peace deal and using her to do so and Iseult is dealing with the fact that she has powers and was basically lied to her entire life, and learning how to use her powers. Safi spends a majority of the book being on the run and is guided by Merik, Merik is an awesome character. He is basically Malcolm Reynolds meets Nathan Drake. While he is reluctant at first he does help her and you even like the relationship between the two. While it did feel a bit rushed, both characters were at least developed enough to cheer them on. 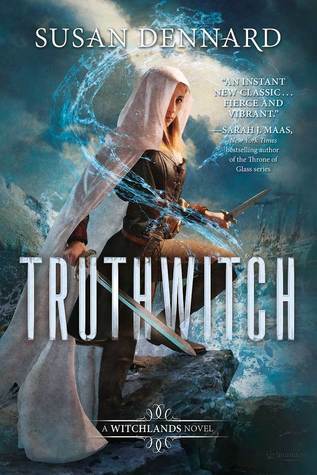 In the end Truthwitch was a book worth the hype, it was a real engaging read that did a great job world building but also developing its characters. I look forward to reading more of this series. Great review, Darnell. I lovedddd Merik and Safi’s interactions. They weren’t constantly cracking me up with all of their sassy comebacks. So funny! Another great review 🙂 I am actually pleased to see that this one worked well for you. I was initially excited and then began seeing some negative feedback. You have renewed my faith! Thanks, I mean I heard mixed reviews but I decided to read it and I am glad I enjoyed it.